Support us on Patreon to keep GamingOnLinux alive. This ensures we have no timed articles and no paywalls. Just good, fresh content! Alternatively, you can donate through Paypal, Flattr and Liberapay! AMD have announced that they are working on a big driver update. 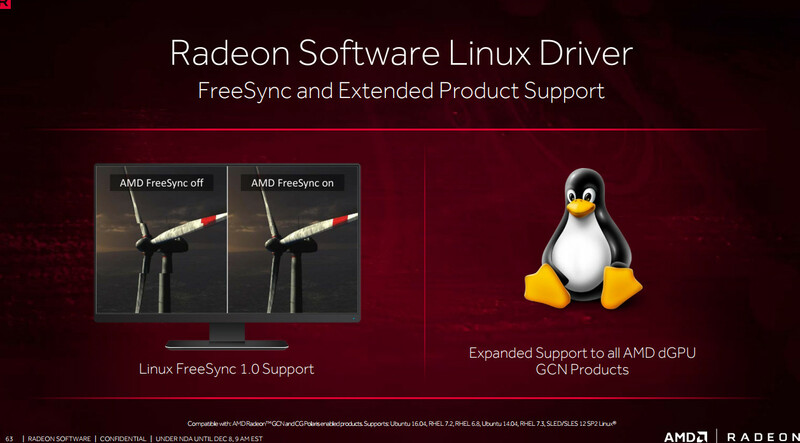 The Linux driver will support FreeSync and have wider support for their different GPUs. Those look like the only real new things the Linux driver will get, as those two slides are the only time we are specifically mentioned. Going by the slides, it sounds like it's an update that will use their newer AMDGPU driver. From the way it's presented, I would imagine FreeSync would only be supported on the proprietary part. It includes tons of Windows-only stuff too, like an updater, support for capturing gameplay and more. Not really interesting to us though, so I won't go over all the other Windows-specific stuff. It's worth noting, that this was supposed to be under an NDA until December 8th (it says it in the smallprint in the footer), so someone leaked this out, which is why you I can't find any official word from AMD on it. We do often include affiliate links to earn us some pennies. We are currently affiliated with GOG and Humble Store. See more information here. The comments on this article are closed. Interpretation: AMD GPU Pro will see a stable release. AMD is also working on slimming down the DAL for AMDGPU, which is now called DC instead of DAL, and may be ready by kernel 4.11, but that is speculation. DC is also supposed to be bringing AMDGPU to GCN GPUS's offcial, instead of through experimental support. From what I heard, without DAL, there is no Freesync. And although some people hope, it is still not clear whether DAL will arrive for the 4.11 kernel. So I am not sure what we are seeing on this presentation or more precisely, when it will happen. Quote DC is also supposed to be bringing AMDGPU to GCN GPUS's offcial, instead of through experimental support. Experimental AMDGPU support for GCN 1.0 and 1.1 are not closely related to DC (DAL), as far as I know. It is experimental because there are still some issues and worse performance in some cases. I've been waiting ages for FreeSync support. All my hardware supports it, so I'm just waiting on the software stack to catch up. I'll be very upset if FreeSync is only supported by the proprietary stack (which most AMD users on GNU/Linux rightfully no longer use anyway, based on the hardware survey here). It would be a stupid move by AMD, but I'm quite sure the intent is for it to arrive on the free software stack once the DC arrives and this won't be a problem. boltronics I've been waiting ages for FreeSync support. All my hardware supports it, so I'm just waiting on the software stack to catch up. I am personally waiting for it to enter Mesa. Even if it takes longer, what's another year at this point? The rest of that package is fantastic. tuxintuxedo From what I heard, without DAL, there is no Freesync. And although some people hope, it is still not clear whether DAL will arrive for the 4.11 kernel. So I am not sure what we are seeing on this presentation or more precisely, when it will happen. IIRC, they ship, compile and insert the module as part of their PRO stack. Some distributions also patch it in. boltronics I'll be very upset if FreeSync is only supported by the proprietary stack (which most AMD users on GNU/Linux rightfully no longer use anyway, based on the hardware survey here). It would be a stupid move by AMD, but I'm quite sure the intent is for it to arrive on the free software stack once the DC arrives and this won't be a problem. That is all, there is no need to replace anything else, the open source drivers happily work with this amdgpu driver, that's the advantage of a shared kernel driver. Then everything from Freesync, HDMI audio etc. starts to work. I had to do this myself because I have 3 monitors, and apparently without DAL, you can use max 2 monitors. 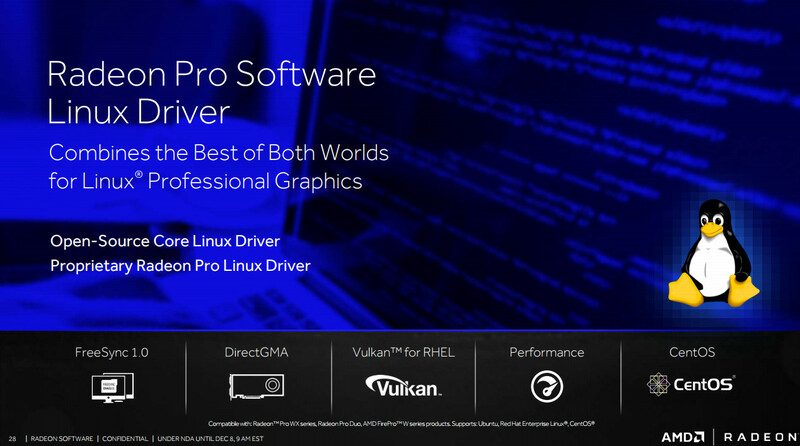 The full GPU-PRO driver is on my to-do list, but it is rather tighyly coupled to the supported Linux distributions at the moment. You can't just install the rpm's. I haven't been able to make it work for now, but will try again. While you're here, please consider supporting GamingOnLinux on Patreon, Liberapay or Paypal. We have no adverts, no paywalls, no timed exclusive articles. Just good, fresh content. Without your continued support, we simply could not continue! You can find even more ways to support us on this dedicated page any time. If you already are, thank you! CityBuilder but with Moral concepts?